Recent killings of and bomb explosions targeting innocent CIVILIANS in Nugegoda, Monaragala, Dambulla, Welioya and Colombo are clear examples of the racism & cruelty of the LTTE. Recent massacres of unarmed CIVILIANS in public buses, shopping complexes, and remote villages prove that the LTTE is a racist organization whose objective is terrorism and ethnic cleansing. In striking contrast, nearly a million Tamils live in harmony with the Sinhala Community in western Province alone, making Colombo a city of racial harmony which Sri Lankans are proud of. It is in this backdrop that certain opportunistic disgruntled elements raise a hue and cry about there explosions hinting that the LTTE terrorists, who kill innocent CIVILIANS, can be excused for countering attacks by the tri forces and indirectly blaming the government and the President and the security forces for waging a heroic war against terrorism. 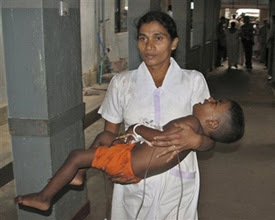 (04-FEB-2008) LTTE Claymore Bomb in Ethawatunwewa, Welioya; 13 Civilians Killed, 16 Injured. (02-FEB-2008) LTTE Bomb Blast at Dambulla public Bus stand; 20 Killed, 70 Injured. 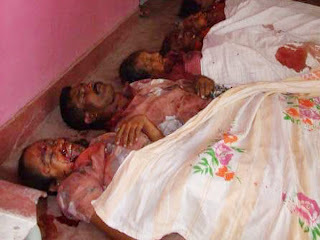 (16-JAN-2008) LTTE Terrorists kill 27 Civilians in Bus & Slaughter 6 Farmers in Southern Sri Lanka - Monaragala. 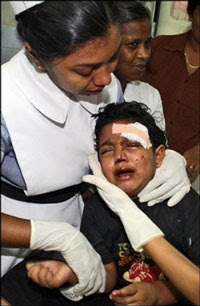 (02-JAN-2008) LTTE Terror Bomb Kills 4, including 2 School Children, in Colombo. 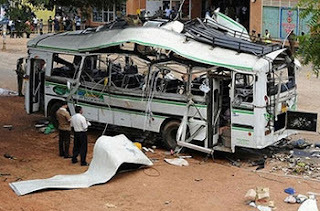 (05-DEC-2007) LTTE Bomb in Passenger Bus Kills 15, Injures 38 in Abimanpura, Kebethigollawa. 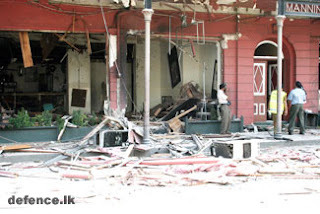 (28-NOV-2007) LTTE Terrorist Bomb Blast in Shopping Complex in Nugegoda, Colombo; 18 Killed, 34 Injured. LTTE terrorists have carried out a cowardly claymore blast targeting a civilian bus at Ethawatunuwewa around 3.50, this evening. According to the defence sources in the area, the terrorists have targeted a state owned public transport bus that was plying from Anudradhapura to Janakapura at a location close to "Kobbakaduwa Junction". LTTE terrorists carried out cowardly bomb blast targeting innocent civilians at the Fort Railway station this afternoon (February 3). 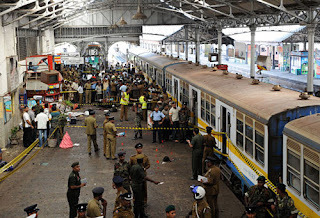 Eleven people have been killed and 103 others suffered injuries as a suspected LTTE suicide bomber blew herself up on the third platform of the railway station around 2.10 p.m, said the defence sources. LTTE terrorists exploded a bomb in side a public transportation bus targeting civilians in Dambulla this morning (February 2), defence sources said. According to available information, the blast was occurred in a privately owned bus traveling from Kandy to Anuradhapura around 7 a.m. So far , 18 people have been killed including 16 females and over 80 others suffered injuries due to the explosion, the sources say. Periyamadu, Mannar LTTE attack kill innocent Tamil children forcibly taken to LTTE baby Brigade. The LTTE blame Sri Lankan forces for this inhuman brutal act. LTTE target and detonate bombs at public transport carrying civilians. Their main aim is to create chaos among civilians and start a riot similar to 1983 to gain international reputation and support in their loosing battle in North says military spokesman Udaya Nanayakkara. LTTE terrorists ambushed a bus carrying about 80 innocent civilians at Helagama on the Buttala- Monaragala road around 7.40a.m. (January 16). The bus that was carrying large number of schoolchildren, office workers and poor peasants was first attacked with a powerful claymore blast and then fired up on by the terrorists. JVP Parliamentarian Wimal Weerawansa points out that statements made by certain elements that LTTE terrorist violence increased due to the abrogation of the ceasefire, are baseless. In a special statement to the House today,(05/02/2008) he said the terrorists targeted attacks on civilians not after the abrogation of the ceasefire agreement. The tigers detonated a bomb in the Nugegoda town before this treacherous agreement was abrogated. The tigers blasted buses at Kebittigollawa and massacred innocent civilians when the ceasefire was in operation. It is clear that this agreement signed on 22nd February 2002 did not hinder the ruthlessness of the tigers. He queried as to why the tigers were killing the civilians with women suicide bombers. The tigers were used only for VIP targets. He also queried as to the need of the terrorists to send a female suicide bomber to kill innocent commuters at the Colombo-Fort Railway Station. Mr. Weerawansa emphasised that the tiger terrorists have become desperate. Four people including two schoolchildren and a mother were killed when LTTE terrorists carried out a cowardly bomb blast targeting civilians and an army bus in Colombo this morning (January 2). One soldier who was traveling in the bus was also killed in the explosion. The terrorists triggered off the claymore bomb right opposite the Infant Jesus Roman Catholic church at Slave Island around 9.30.a.m. At least 15 bus passengers were killed and 38 wounded Wednesday in a roadside bomb attack in Sri Lanka, police said as the military claimed 36 more people were killed in other violence. 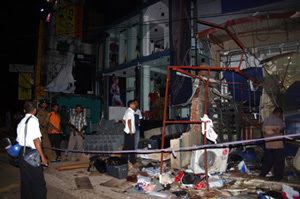 At least 18 died and 34 were injured when a bomb exploded near the Nolimit clothes store at Nugegoda Bo-tree junction around 5.55pm. Police said the explosion occurred when they were checking a suspicious parcel which had been left with the Nolimit baggage counter. Eyewitness reports said that several buildings adjoining the No-limit store had also been badly damaged. Reports said that the casualty figures could be high since the area is busy and crowded at that time. A fire that had broken out following the explosion had been doused. In this chilling security camera footage, a female suicide bomber (Tamil Tiger terrorist) on a mission to kill a Sri Lankan Cabinet minister of Social Services and Welfare, Douglas Devananda (a moderate Tamil political leader), is seen patiently answering questions in a bustling government office before calmly standing up and detonating the bomb hidden in her bra. 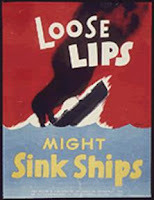 The above phrase ‘Loose lips may sink ships’ was coined as a slogan during WWII as part of the US Office of War Information's attempt to limit the possibility of people inadvertently giving useful information to the enemy, thus subverting the cause of democracy fought for by the Nations patriots. The poster (shown above) widely distributed in the United States is also from that era. This catch-cry is highly applicable to the prevailing environment in Sri Lanka as she battles, not only the brutal Tamil Tiger Terrorists but also a number of other self centred entities surreptitiously destroying Sri Lanka’s hard fought independence and its democratic way of life. The question amongst the citizenry is whether this relentless undermining of Sri Lanka’s credibility, record on human rights and independence is done unwittingly or for what ever the reason, knowingly. I believe it is the latter. In the case of Sri Lanka, the question is not whether ‘Loose lips might sink ships’ but that ‘Loose lips are torpedoing democratic Sri Lanka’s independence, thus compromising the freedom of its citizenry in perpetuity. Prabakaran, the LTTE’s manic and despotic leader in his Mahaweer day speech made an impassioned plea to the international community that instead of isolating him, they should come to his rescue and create the external environment conducive to establishing his ethnically cleansed, racist, monolingual, despotic regime in the North and East of Sri Lanka. This begging for external interference is parroted further by B. Nadesan who said that “Tamil people must live with freedom in their homeland. Therefore, the international community must understand this, and immediately remove the bans it has placed on the LTTE and recognize the right of the Tamil people to live with self-determination in their homeland”. The hilarity of this ludicrous plea only has entertainment value except to note that Nadesan, once again is looking to the international community for salvation. There has been stoic resistance to the thesis put forward by a number of countries such USA, Australia, France, Norway and the EU and organisations such as the UN, that the abrogation of the fatally flawed Cease Fire Agreement (CFA) by President Rajapaksa’s Government is regressive. Sri Lanka is also being battered by a troika of issues championed by the so called leading western democracies, namely violation of human rights, Media Freedom and the need for a political solution to the LTTE’s terrorist problem. Furthermore, a former Foreign Minister of Australia, Gareth Evans irresponsibly floated the Right to Protect (R2P) concept when he was given the opportunity to make last year’s Dr. Neelan Thiruchelvam memorial speech. Suffice to say that Dr Thiruchelvam was a victim of a LTTE suicide bomber and that Mr Evans, rather than protect the victims of terrorism laboured to justify the protection of the perpetrators of terror. Twenty five years of relentless terror, countless suicide bombs, assassination of political leaders, the possibility of infecting India, the suffering of the people and the globalisation of terror have all combined to focus the international community’s disproportional attention on Sri Lanka. Almost beaten to the point of no return militarily, the LTTE is banking on the International Community’s intervention to reclaim even a modicum of respectability. Operatives in Sri Lanka are contributing to this LTTE cause wittingly through unsubstantiated accusations, political opportunism, false reporting, exaggerated statements and in some cases, blatant lying. Political opportunism: A case in example is the stance taken by political parties such as the TNA blaming President Rajapaksa’s government for the death of MP T. Maheswaran. The calls by the LTTE’s proxy were parroted by the UNP who considered it opportunistic to bolster its dwindling political capital. 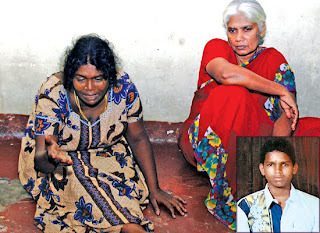 Investigations by IGP Victor Perera have concluded that the LTTE’s micro-pistol gang was responsible for killing Mr Maheswaran. However, why spoil a good storey by sticking to facts. The UNP-TNA alliance supported by a coalition of disingenuous NGO’s still continues to slander the Government blaming them for Maheswaran’s death hoping that some of the thrown mud will stick. Unsubstantiated accusations: Some elements of the Media in Sri Lanka continue to publish unsubstantiated scuttlebutt to denigrate Sri Lanka. Recently, The UNP charged in Parliament that high authorities of the government and the defence establishment had taken a decision to assassinate UNP MPs, Lakshman Seneviratne and Johnston Fernando. UNP Leader, Ranil Wickremesinghe said that these MPs are now in a dilemma whether they should risk heir lives by criticising the government or remain tight lipped ignoring all misdeeds. Some of the irresponsible Media sensationalised the UNP statement by heading their report ’Two MPs on Government’s Hit list’. Once again, one must be cognisant of the consequences of fuelling the fire by publicizing blatant lies which denigrate the Government and even the valiant armed forces falsely accused of colluding with the Government to kill opposition MPs. False reporting: Another sensational newspaper headline screamed ‘Sri Lanka loose voting rights at UNHRC’. This news item which was widely publicised by the pro-Tiger TamilNet was subsequently found to be malicious, misleading and inaccurate. A retraction was made by the Newspaper on the following day but by then, the horse has bolted from the barn. Perhaps the event was purposefully orchestrated to create a poor Human Rights image of Sri Lanka. Exaggerated statements: Foreign funded NGO’s have colluded to use the withdrawal of the Government from the fatally flawed CFA to paint a picture of gross violation of human rights. The National Peace Council leading the charge state ‘Only the International Community can make a difference’. They seem to suffer selective amnesia, forgetting the 5000 plus violations of the CFA by the LTTE including Hon. Kadiragarmar’s assassination. Emboldened, Elaine Pearson from Human Rights Watch, urge the International Community to establish a UN Human Rights country office in Sri Lanka. Misinformation: The Free Media Movement is neither a free nor a significant movement focused on media. Their sole purpose in life seems to be revolving around campaigning against the apparatus of the Government and the Minister for Mass Media. Releasing a statement it claims that a caller from the Kytes police station made a threatening phone call to E Saravanapavan, Managing Director of the Uthayan Newspaper requesting the cessation of publishing the newspaper with immediate effect. If the media is professional, they should have investigated first the authenticity of the so called ‘fact’ that the caller had identified himself to be from the Kytes police station (a dumb admission). Instead, they sensationalised the issue by releasing a media statement. The innuendo is that Sri Lanka’s police are involved and hence the Government is responsible. Probably next, the four charred bodies found in the Buttala jungle belonging to Hashish growers (dead in a gang dispute) too would be associated with the Government, attempting to further strengthen the case for international intervention in Sri Lanka under the pretext of protecting human rights. This is not a blind defence of the Government or an attempt to white wash its many failings. The country is threatened by unnecessary international interference. There are many opportunists praying for this hoping to capitalise from the resulting chaos. Do not aid LTTE’s last gasp desire willingly or unwillingly. It is time for these anti nationalists to button their loose lips. Please check the two pictures of the following two articles. One is in Iraq and the other is in Mannar, Sri Lanka (an area still not liberated from the terrorists by the Sri Lankan government). But the catch is that "TAMIL EDITORS" (another front organization of Tamil Tigers) copied the picture in Iraq and expressed as it was in Mannar, Sri Lanka. Same picture, but different story! This is how the Tamil Tigers (LTTE) and its propaganda machine are deceiving the world. The world MUST open its eyes. The survey was carried out by the Sunday Times newspaper and the Nelson Institute in order to look into the island's achievements after gaining independence. LTTE terrorists have carried out a cowardly claymore blast targeting a civilian bus at Ethawatunuwewa around 3.50, this evening. According to the defence sources in the area, the terrorists have targeted a state owned public transport bus that was playing from Anudradhapura to Janakapura at a location close to "Kobbakaduwa Junction". 13 civilians have been killed and 16 others including children injured in the explosion. According to the hospital sources the victims have been initially taken to Padaviya hospital. Six out of them, including two children have been transferred to the Anuradhapura Hospital. Two among the dead are women, the sources added. Your communiqué on the human rights situation in Sri Lanka piqued our interest since we too have had an on going concern that the mandate your office was given to provide relief and safeguard the lives of children particularly in theatres of war, as in the North and East of Sri Lanka had not been forthcoming. We have long questioned why Velupillai Prabhakaran has not been charged with war crimes, while Charles McArthur Taylor, former President of Liberia has been arrested by the United Nations Justice Tribunal for using child soldiers during his tenure as the President of Liberia from August 2, 1997 to August 1, 2003. In comparison to Charles Taylor’s six year involvement in recruiting child soldiers, Velupillai Prabhakaran has been abducting and recruiting children for almost 25 years since late 1983, and the numbers as recorded by UNICEF and Human Rights Watch are in the thousands. We believe that your organization should invoke the Security Council Resolution 1612, which is meant to take punitive action against violators of the rights of children in armed conflicts. Which, in this case, the leader of the LTTE, Velupillai Prabhakaran is the perfect candidate to be charged for such ‘war crimes’. While we may be repeating information which you already have in your files, it is incumbent upon us to bring to your notice that Velupillai Prabhakaran as leader of the LTTE has committed four grave violations against children in the North and East of Sri Lanka for over two decades, which are offences chargeable as ‘war crimes’. They are: (i) Attacks against schools and civilians centers; (ii) Abduction of children; (iii) Denial of humanitarian access to children; and (iv) Use of children in armed conflict. In March 2005, following strong criticism and condemnation from the United Nations Security Council for continued recruitment of child soldiers; the LTTE launched an offensive to get UNICEF expelled from Sri Lanka. By then UNICEF had reported more than 4,700 odd cases of recruitment and re-recruitment of children by the LTTE, by force, abducting children while on their way to school or during religious festivals, et cetera. UNICEF is also on record as having stated that the LTTE conscripted more than 1,600 children out of the Tsunami displaced camps in 2005 itself. What should not go unnoticed is that, according to Human Rights Watch, almost all the suicide bombers, over 200 of them were trained from the ranks of the child soldiers. While we value your timely reiteration that such violations are indeed ‘war crimes’ and of systemic grave violations of the Rights of the children in the North and East of Sri Lanka, we now await your action in exercising you rights as the UN High Commissioner for Human Rights to issue a warrant for the arrest of Velupillai Prabhakaran and charging him for war crimes in the International Criminal Court. The time has arrived for such an action and anything less would be a disappointment to us as well as the growing consensus at the UN for not taking punitive actions against the violator of the rights of the Tamil children in this armed conflict. If Liberia’s Charles Taylor has been charged for his six-year violations on children for recruiting them as child soldiers, so should Sri Lanka’s Liberation Tigers of Tamil (LTTE) leader, Velupillai Prabhakaran for his violations of Tamil children for the past 25 years. We shall be looking forward with interest on your progress in bringing this war criminal to Court, which will bring immense solace not only to the Tamil children but also to their parents and immediate family members. President - United Sinhalese Association in Italy- Rome.